An alternative to the perfect fit blinds that are specifically designed for conservatory roofs. What makes these blinds different are the fact there is no drilling or screwing required to fit this type of blind and that means you will not void your warranty! 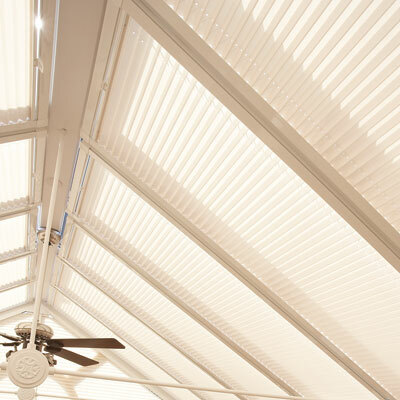 The conservatory roof blinds are available with the pleated blinds only. The frames are available in white or brown. Since the blinds are delivered readily assembled, the average time spent fitting the blinds is reduced by up to 50% when you compare that to the fitting time of other conservatory roof blinds. There are no gaps between the frames and the blinds, as all of the hard work is done by the fitting team before they even get to your home.